Natural treatment systems (NTS) are ecotechnologies designed to treat water or reclaim degraded sites. 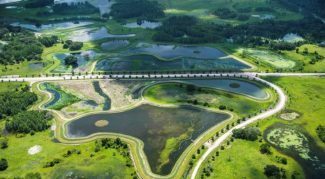 Treatment wetlands are a core ecotechnology that have entered the mainstream of large municipal projects for tertiary wastewater treatment, water reclamation, water supply pretreatment and stormwater management. The award-winning 4G Ranch Wetlands is a public-private collaborative effort between Pasco County, Southwest Florida Water Management District and the Phillips Family who owns the land. This innovative, reclaimed water project facilitates a more holistic watershed management approach by helping improve an area that has seen severe ecological degradation from decades of groundwater use. Nearing completion, the 4G Wetlands consist of a 175-acre groundwater recharge wetland system constructed on uplands pastures. The system is sized to receive 5-million-gallons-per-day of reclaimed water to passively recharge the surficial and Upper Floridan aquifers, while reducing nitrogen levels to background concentrations. For more information on this innovative approach to natural wetlands treatment, or any of CH2M wetlands pollution projects, view our roster of NTS presentations for the Wetland Pollutant Dynamics and Control Conference (WETPOL), August 21-25, 2017 at the Big Sky Resort, Montana, USA.